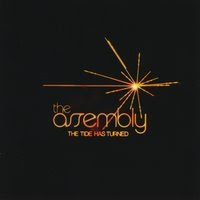 Chicago's The Assembly decided to take a chance by self-recording and producing "The Tide Has Turned" - their first full-length album - at band member Nathan Suh's apartment after the producer of their previous two EPs moved away. That's a pretty amazing feat considering the album sounds like the work of pros, crafted to very effectively showcase the band's electro-tinged, (mostly) dark rock. According to vocalist and guitarist Dave Suh (formerly of local band Caviar), "The Tide Has Turned" is his attempt at writing the soundtrack to dystopic novels such as "Fahrenheit 451," "1984" and "Slaughterhouse-Five," and for the most part the music makes that clear. The brooding, spacey opener "New Kill Remediate" sets the chaotic scene, making way for menacing rockers "Optimization" and "Tear Yourself Apart." While these songs are certainly well-executed, the band thankfully prevents the record from becoming suffocating and overwrought with darkness by introducing lighter sounds. "Systematic Unknown," while still lyrically far from upbeat, features open, anthemic qualities that lift some of the load off the listener, and the airy "Invisible Forces" continues the lighter vibe. Later, the melodic "Changing Now" serves up the brightest, most hopeful moment. It's full of hooks - almost poppy - and is one of the strongest cuts on the CD. The band rocks the album to a close with the hard-hitting "If They Exist," which ends the running story with a question mark. The Assembly are some of the most talented local musicians I've heard in a while, sounding confident and convincing throughout "The Tide Has Turned." They avoid falling into the trap of dull and predictible by drawing as much influence from classic, tried-and-true acts such as David Bowie, Smashing Pumpkins and The Smiths as they do from Interpol and similar bleak "indie" bands. This is definitely one to check out, especially if you like a little darkness in your rock. I'm definitely going i think they are incredible! I love their dance rock aesthetic and their monolithic juggernaut of guitar licks.